THE CANADIAN PRESS -- A royal decision to go hatless has sparked a volley of tweets expressing everything from outrage to support after Prince William and Kate chose not to don two special cowboy hats this evening. The custom-made, white Smithbilt hats were presented to the royals by Calgary Mayor Naheed Nenshi soon after they arrived at the airport. But the royals chose to hold the hats -- which are Calgary's version of the key to the city -- instead of placing them on their heads. That caused one man to refer to the couple as snobs and caused another to tweet his disbelief at their actions. At the same time others expressed support or nonchalance at the royal decision -- one woman even took to Twitter asking the country to "quit freaking out" about the royals and their new hats. 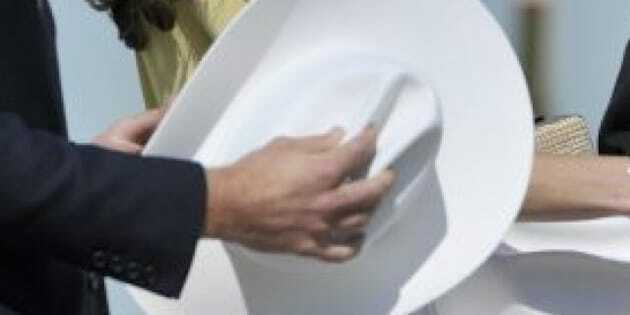 The white-hatting ceremony has been celebrated by dignitaries visiting Calgary for more than 60 years and is a symbol of the city's cowboy culture.